Finally. The day we've been waiting for. We're 9 weeks along and we're just now getting our first pre-natal appointment! I meet my husband in front of the office building and we get lost trying to find our way to the OB's office. We are giddy, excited, nervous and can't wait to see our little one. We're late getting into the office which works to our advantage because they call me right in. Damon waits in the waiting room during the first part. For those of you who don't know us, we're super open with each other. To some of my friends' horror, I have no problems passing gas in front of him - even while not pregnant - and have been known to ask him to pull my finger from time to time. But this, to us, is a little different. We've decided that my private regions should remain "private" through this. I don't want him to start looking at "down there" as a science experiment. So, I get swabbed, poked, checked and then get ready for the ultrasound. Thanks to my friend Molly for giving me the head's up that the first ultrasound is done vaginally. Otherwise, it would have been a different experience. The nurse brings Damon in the room and she and the doctor tease him a little bit to try to make him feel more comfortable. He takes it in stride and grabs my hand. We both turn to the screen and she moves the "thingy" (I'm not using "thingy" because of a lack of words, but because I can't think of any clean terminology right now) around and an image of a peanut in a bubble appears on the screen. Damon and I tighten our grip, look at each other and smile. So precious. So wonderful. This is exactly what we needed to see, feel, hear, experience to know that we were indeed pregnant and that there was a little baby growing inside of me. It made it all real. Then, she moved the thingy around again and said, "And here's baby number 2." We awwed again and then, "Wait.... what?" She smiled that knowing smile and moved her little magic wand. "Here's baby number 1 and here's baby number 2," she showed us on the screen. I threw my head around to look at my husband. I couldn't tell if he was completely estatic, about to pass out, or about to run out the door. He just stared at the screen. Later he told me he got tunnel vision and was trying not to pass out. I'm sure my eyes were as big as moons. The tears started and (I hate to admit it) at first, not out of joy. I was scared. No, I was terrified. Suddenly, our house got really small. I had already planned out how I was going to arrange the furniture in my house to make our guest bedroom the nursery, our office the guest bedroom and bring the office furniture into our bedroom. I envisioned where the highchair would sit in the kitchen, the swing in the living room. I knew how the nursery was going to be set-up - where the crib went, changing table... And I knew that it was going to be tough to include TWO of everything in the humble space we have. Then "double the diapers" popped in my thoughts again. I am going to have to take care of TWO babies!!! I don't really know how to take care of one baby right now... how am I going to take care of two!? 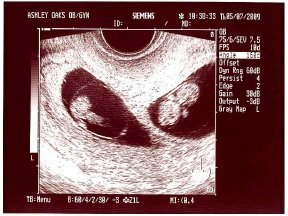 Horror stories that my mom told me of my aunt who had twins started running through my head. Stories how she would breastfeed one, then change the other. Then breastfeed the other, then change the first... then do it all over again while trying to get some sleep and still maintain her sanity. She did all this by herself because her husband had left her shortly before she gave birth. OMG! I can NOT do this by myself! I look at Damon again to make sure he's not trying to head for the door. I look up at him and he has the most unexpected look on his face. There are creases around his eyes and he is showing his teeth. Wait... is that a... is he smiling!? He notices me looking at him, turns to me, squeezes my hand and then kisses me on the forehead. Then turns back to the screen and continues smiling. I suddenly feel a calming sensation run over me. It's going to be okay. We're going to do this together. We're going to have two babies and it's going to be okay. I come back to reality to see the flashing lights on each baby - their heartbeats! My heart melts. She moves the thingy so both babies appear on the screen and takes a picture. She gives us multiple copies. I look at one and instantly fall in love with our two babies. We chatted with the OBGYN a little longer, asked questions and then she left us with handfuls of pamphlets on being pregnant and information on support groups for parents of "multiples". The rest of the day we're both on cloud 9. We share the news with everyone and everyone is so happy for us! I pray for the first time in years as I go to bed that night and wake up feeling relieved, confident and completely elated. It's going to be okay.